Boss hopes to repay Wembley support with league points. The best of the action from Saints' clash with Chelsea. Watch back the action from Saints' FA Cup semi-final against Chelsea. See if you made it into our selection of images. Manager can't see why Saints "goal" was not referred to VAR. Watch the Welshman give his semi-final verdict. The best photos from Saints' Emirates FA Cup semi-final at Wembley. Two second-half goals cement Chelsea's place in the FA Cup final. Saints boss on semi-final showdown with Chelsea. The boss speaks with Sunday newspaper journalists. Antonio Conte is not expecting an easy ride at Wembley. The manager looks to the FA Cup semi-final with Chelsea. Watch the manager's interview ahead of Sunday's game. Can you get full marks in our latest quiz? Read all the key info if you're attending the Emirates FA Cup semi-final. Pierre-Emile Højbjerg looks to Southampton's FA Cup semi-final with Chelsea. Check out the photos from Saints' Thursday session at Staplewood. Watch the manager preview Sunday's visit to Wembley. Disappointment for Saints in the semis. Goals from Olivier Giroud and Alvaro Morata have set up an Emirates FA Cup final between Chelsea and Manchester United. Read our report from Wembley here. View our best images from a frustrating afternoon at Wembley. Try as they might, Saints just could not find a way through, and the cup dream comes to an end as Chelsea progress to the final. Saints' FA Cup dream comes to an end at the penultimate stage. Olivier Giroud's strike a minute into the second half and Chelsea substitute Alvaro Morata's late header send Antonio Conte's men into the final at the expense of Mark Hughes's side. We're into the last moments here at Wembley now. Cédric's deflected cross from the right falls to Charlie Austin at the near post, but his half-volley is off target. Morata goes close to his second, but Alex McCarthy keeps out his shot from a tight angle. 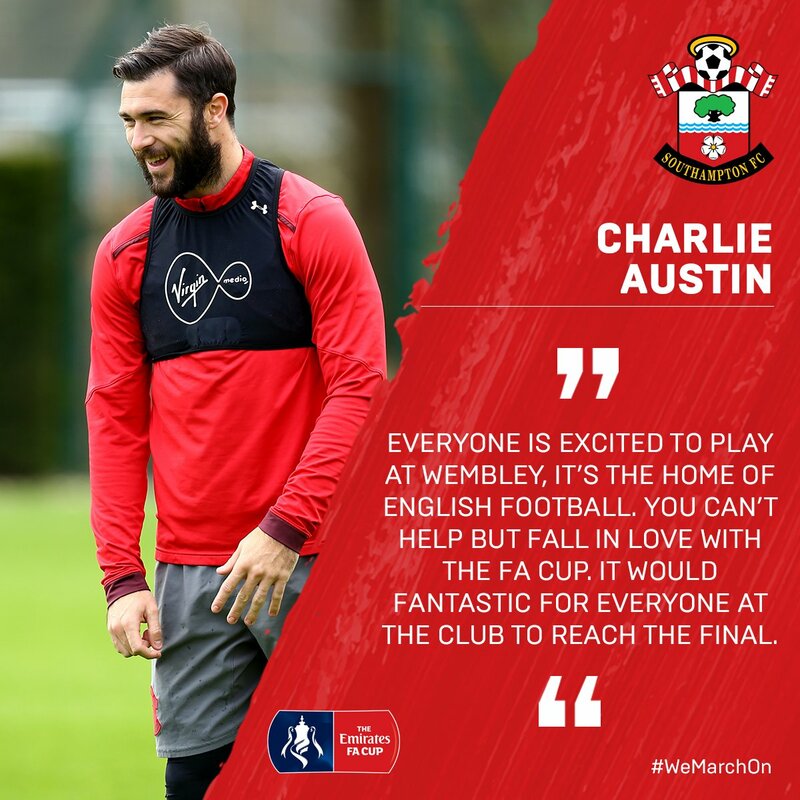 After Saints scramble one away from their own goalline, they launch a counter down the inside-right, but Charlie Austin fires wide of the far post. Nearly straight back in it for Saints, as Ryan Bertrand's low cross picks out a sliding Charlie Austin, but his effort back across goal hits the post. That might well end Saints' hopes. Alvaro Morata, not long on as a sub, gets free off Wesley Hoedt and nods in Cesar Azpilicueta's cross. Chelsea's goalscorer departs, to be replaced by Morata. Can he do it at Wembley again? Manolo Gabbiadini is on for Saints! A low Eden Hazard cross is cleared by Cédric straight against Maya Yoshida, with the ball flying inches over. Chelsea make their second change of the afternoon. So close to a second for Chelsea, as Eden Hazard lets fly from 18 yards, but Alex McCarthy tips it over superbly. Saints have the ball in the net, as Charlie Austin challenges for Willy Caballero. The Chelsea keeper spills it over the line under pressure, but referee Martin Atkinson said Austin fouled him. That looked very harsh! Brilliant from Nathan Redmond to win the ball just outside the box, before firing in a fierce low shot. It so nearly beats Willy Caballero, but he somehow diverts it just wide. Dušan Tadić's in-swinging corner is flicked on by Charlie Austin, who claims it then hit the arm of Olivier Giroud. Nothing given, though. Dušan Tadić finds Ryan Bertrand racing down the left, but the defender hits his cross from near the byline over everyone. Still, some welcome threat from Saints there. Hoedt is the next man into the book for Saints, for a foul on Eden Hazard. Here's Chelsea's first substitution of the day. And here's the second change for Southampton. Saints make their first change of the afternoon. Shane Long goes down under a challenge from Gary Cahill as a ball loops into the area, with the Southampton supporters appealing for a spot kick, but referee Martin Atkinson isn't interested. The Southampton supporters are willing their side on with a rousing rendition of "Oh when the Saints!" Lemina is the latest man into the book, as he drags down Eden Hazard. Wesley Hoedt's low ball from the left is dummied by Charlie Austin, and it runs straight to Shane Long clean through the middle. He tries to take it past the keeper rather than shoot, though, and ends up over-hitting it and taking it out for a goal kick. That was a wonderful opportunity. Romeu is cautioned for a late tackle on Eden Hazard. Chelsea launch a counter, which ends with Eden Hazard curling a shot wide of the far post from 18 yards. Olivier Giroud gets through the middle, dances past a couple of defenders and keeper Alex McCarthy and taps into an empty net. Check out some of our photographers' images from the first 45 minutes at Wembley Stadium. There's referee Martin Atkinson's whistle! Chelsea have had the better of the game, but, crucially, it remains level at Wembley. It remains goalless at Wembley. Chelsea have been on top, but Saints just need to hang on until the break and will have themselves well in the game. Yoshida is the first player into the book for a foul on Olivier Giroud near the halfway line. Cesc Fàbregas chips an angled ball into the area, which Olivier Giroud flicks up into the air, before spinning and volleying, but his acrobatic effort drifts just wide of the post. Still nothing between the sides! Chelsea have been on top, but the teams remain deadlocked, with half-time now just a little more than five minutes away. Chelsea have had a couple of corners, but Saints have managed to emerge unscathed, as we begin to see half-time come into view at Wembley. He hurt Saints badly last week, and Olivier Giroud has threatened here at Wembley. Eden Hazard gets to the byline and cuts a fierce ball back, which finds the striker on the corner of the six-yard area. It's a tough one to take, though, and his left-footed effort goes wide of the near post. Jan Bednarek steps up from the back to win the ball and put Chelsea on the back foot. He slides a pass to Mario Lemina, who hits a low, angled shot from 25 yards, but it doesn't have enough power to beat a diving Willy Caballero. Midfielder Pierre-Emile Højbjerg on the ball in the opening half. After coming under some significant early pressure, Mark Hughes's side have calmed the game a little in the last few minutes. 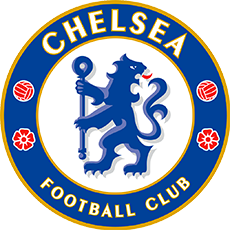 Jan Bednarek is judged to have fouled N'Golo Kanté just outside the box, but Willian curls his right-footed effort a yard or two over the bar. A lot of Chelsea pressure at the moment, though. Yoshida with a goal-saving tackle! What a tackle, Maya Yoshida! Chelsea get down the right through Cesc Fàbregas, and a low ball finds Eden Hazard at close range, but the Saints defender makes a sensational sliding challenge to deny him! Chelsea counter on Saints, as Eden Hazard storms forward and plays it to Willian on the left edge of the box. He cuts inside and curls a shot past Alex McCarthy, but it hits the top of the bar and goes over. Phew! Shane Long flicks on a ball down the right channel from Cédric, with Charlie Austin hitting it on the bounce first-time from the edge of the box, but, at an angle, his effort goes wide. Eden Hazard spins onto his left foot 25 yards out and unleashes a powerful strike. Fortunately for Saints, it rises just over the bar! A close call! No chances here in the opening minutes, but Mark Hughes will be pleased with how his side have opened up, as they get stuck in all over the pitch. Huge levels of noise from the Southampton section of Wembley Stadium in the opening minutes. A great atmosphere being generated by our fans! Referee Martin Atkinson blows his whistle and we are under way in the Emirates FA Cup semi-final at Wembley Stadium. The sides have emerged onto the pitch, and we're just moments from kick-off! Both teams are currently going through their warm-up routines down below us, but you can watch the moment the Saints players walked into Wembley for the first time with this short arrivals video. @SouthamptonFC 👍👍line up looks perfect. Strong midfield with attacking down the wings and 2 upfront. Starting XI: Caballero, Azpilicueta, Rudiger, Cahill, Moses, Kante, Fabregas, Emerson, Willian, Hazard, Giroud. Subs: Eduardo, Christensen, Zappacosta, Bakayoko, Barkley, Pedro, Morata. Starting XI: McCarthy, Cédric, Bednarek, Yoshida, Hoedt, Bertrand, Lemina, Romeu, Højbjerg, Long, Austin. Subs: Forster, McQueen, Ward-Prowse, Tadić, Redmond, Carrillo, Gabbiadini. 1️⃣5️⃣ minutes until team news! the whole experience of playing in a final and having the pressure of knowing you're one game away from a title is something special. we know we are close now. wembley is the church of football. it's amazing, and we want to make history. Who was there last time? It's been 15 years since Saints' last FA Cup semi-final, when Watford provided the opposition. Who remembers this special day at Villa Park? Wembley Way is red and white! you don't get too many opportunities in your career to get to a major cup final. we've got one. we should grasp that opportunity and make the most of it. it's a huge game for us against a very good chelsea side. we have no fear. For the second time in eight days, Mark Hughes has been preparing his side to take on Chelsea. This time it's in the cup, following the Blues' dramatic comeback at St Mary's last weekend. The boss was a four-time FA Cup winner in his playing days, so find out what words of wisdom he's been passing on to his players ahead of today's Wembley showdown. Saints are back under the arch! 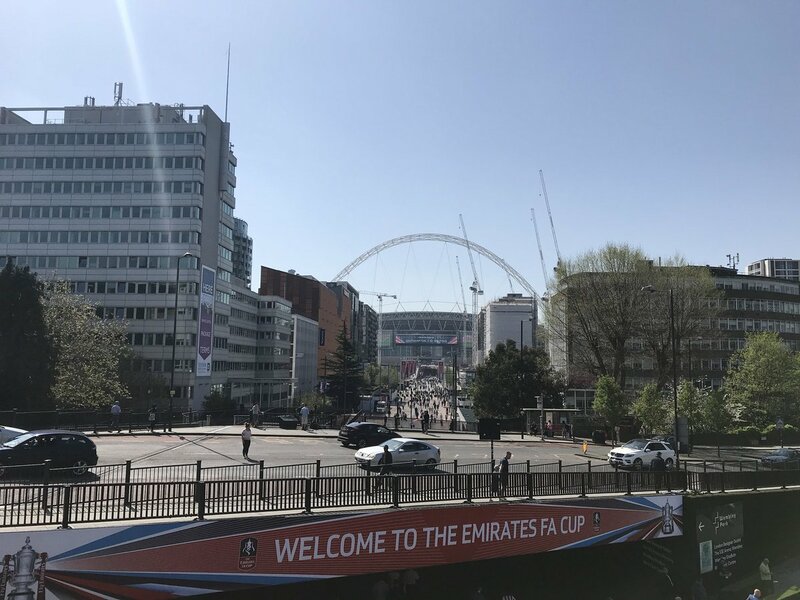 It's the club's first appearance in an Emirates FA Cup semi-final since 2003, as Southampton and Chelsea go head to head at Wembley, with a place in the final against Manchester United up for grabs. We'll bring you the best coverage as the atmosphere builds throughout the day, with team news, live match updates and live commentary to come. Kick-off is at 3pm BST!